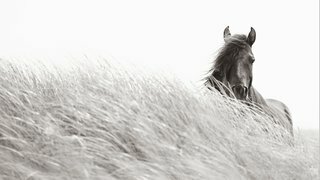 Sable Island, a small strip of land less than a mile wide, is home to a near-mythical breed of completely wild horses. Since no human attempts at colonization have ever succeeded, the land has remained unchallenged as a self-sustaining ecosystem. In this short film viewers are transported to the shores of the Sable through a narrator mysteriously enmeshed within the island. Sable is either a graveyard or a sanctuary to its inhabitants, and this film explores the never-ending cycles that make it so fantastic yet daunting. Drew Doggett is a photographer & filmmaker who focuses on telling the extraordinary stories of places, objects and cultures at risk of disappearing. His practice is characterized by his passion for chronicling diversity and culture while utilizing the discipline he learned working in fashion photography. His work can be found in private and public collections globally, notably the Smithsonian African Art Museum (DC) & the Mariners’ Museum (VA). Benny Nicks is a Brooklyn-based director working in various video forms. His background as a cinematographer & editor informs an approach to filmmaking in which all disciplines are formally intertwined. Ben has collaborated with Usher, James Franco, Daniel Arsham, Justin Peck and others. His lengthy collaboration with Daniel Arsham saw a premier of their short film Future Relic at the 2015 Tribeca Film Festival. Most recently, he directed a narrative film, ‘Hourglass,’ starring Daniel in collaboration with the adidas Originals brand. Read the full Q&AInhabited only by wild horses and, at times, researchers, Sable Island is one of the most intriguing places on earth. PBS spoke with Producer and Director Drew Doggett​ about the history of this island and what it was like to film there. Drew Doggett​: Sable Island has an incredibly rich history - one that is almost too incredible to believe. Beyond its horses, which are just part of the miraculous equation, the island was once used as an experimental prison settlement by the French in the late 1500s. They had given criminals two opportunities: Either they could be executed or try their hand at life on Sable Island. Today, it’s only a home to the horses you see in the film, so you can guess how that went.